I am confused with the biotope tanks. I am seeing many persons doing biotope tank, and the basic, if not the whole, formula is the same..
some nice driftwoods, some jackfruit leaves, low pH, peat moss or tea licker, low light, slight brownish looking tank, add with these some java ferns/anubias/crypts and some neon/harlequin, it's ready. How did we maintain the biotope if in all the cases the ingredients r same? I planned for Sunderban biotope once, had some talk with Bappada, it's really difficult I felt. Btw, someone having biotope tanks dont feel bad, I'm just curious for sunderban biotope. 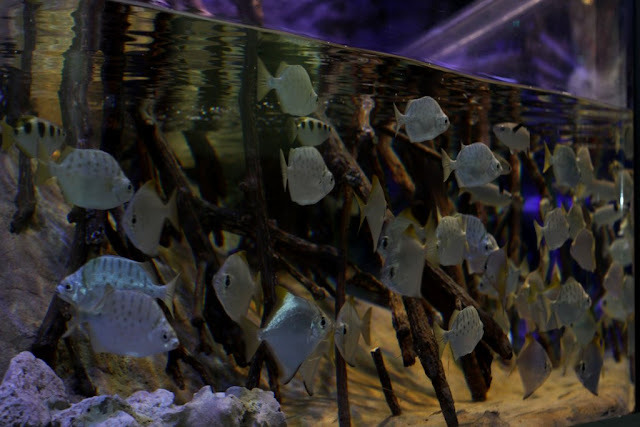 @ tiger, Biotope setup is nothing but keeping fish in the same setup that they would have been in the wild. Not all biotope setup need almond leaves or drift wood with moss. Suppose you want a biotope setup of palar river (close to chennai) you just need some river sand and pebbles. 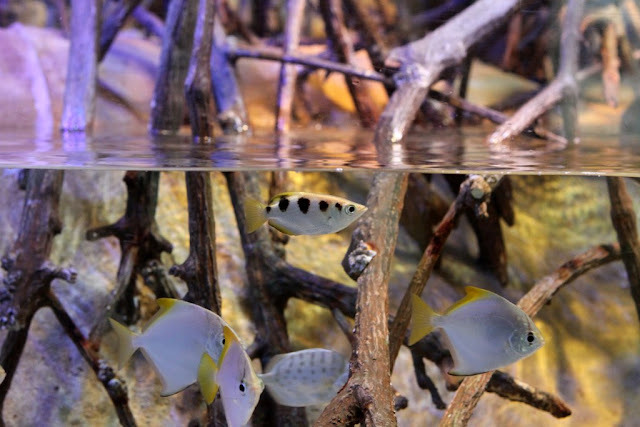 For a sunderbans setup you will need some branching driftwood to simulate mangrove roots, and soil substate and most important put fish like archerfish, Lutjanus sp., Terapon sp, Scatophagus argus or other brackish water fish. A baril or a garra would look out of place. Am not an expert on biotope setups but I guess this would start you up. Take a look at Nayaks fish room thread he has a few nice biotopes. You wouldnt do all that if it had to be an African rift lake biotope setup, where it requires almost no plans and no tea water at all. A setup that fancies a collection of organisms pertaining to a specific ecosystem(and ofcourse the decorative mateiral counts too), thats what a biotope setup is. If a certain plant doesnt exists in the particular biotope you like to portray, then theres no point calling it one. If it does, then its ruled out from being a biotope tank....Simple. Some people go for a general continental/area theme(like Asian biotope/African biotope/Indian biotope), where homogenous fishes from various water bodies in that specific area are used. These setups are accepted as general biotope setups. The second type are specific location wise setups, these are considered to be more authentic type of setups and are sought after by true enthusiasts. Goodluck with your neighborhood Sundarban setup. All you need is a dedicated research and a few collection trips...keep us updated. Liked your classification of the three.....makes sense. Avik, the Sunderbans biotope is still a challenge than others mainly because of the tide simulation! I personally feel for otther biotopes (BW, East Asian, African, Amazon etc)....with the right mix of plants and hardscapes it can be given that natural look. The water parameters are more about attaining stability (not too much PH and temp fluctuation). However, with Sunderbans, that has extreme salinity for half the day and low salinity for the remaining half, it isa major challenge! 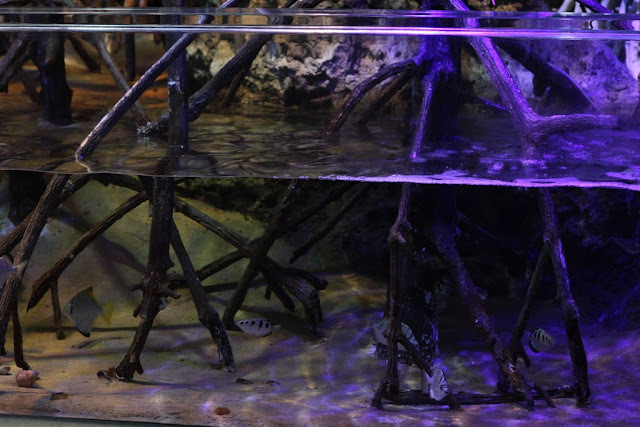 A brackish setup would be the next best thing but it wont exactly be a biotope. Thanks guys for your detailed replies. Can one keep those special breathing roots(locally called "sulo", forget the eng word) of the mangroves underwater? Or will they rot over time? And what about the high tide,low tide processes?How to maintain this? I am not in a stage now to make one, but have a future plan for sunderban biotope, having few mudskippers as well. How could u miss them guys? So these brownish water biotope tanks are in fashion now. U could see the rocks,fine sand biotopes very few. I will be in Calcutta between 20-23rd Jan. How about meeting up one day and discussing Sunderbans biotope ? Also mail me the details of Sunderban biotype. No words to explain the beauty. Bappa da, develop a Sundarban biotype aquarium and I will sure follow u. Are those woods of "Sundri" or any other plant. I have also a 36X18X18 empty tank and reserving for this biotype. Throw away the idea to setup a reef tank. No any information on internet but you guys can make a deep research in Sunderban biotype. For me woods are the main problem, the fishes can manage the constant salinity I think. Go to Henry Island and pick up the woods as many as you want. You don't have to get 'Sundari' roots or Shulo to make that biotope. Sure captain, Tirthada wanna join us @Misra's? Bappada, we can arrange a meet with some kolkata hobbyists as well, if u want. Will carry the conversation in PM.